Thanks for sharing teshi. And keep snapping. What are you packing there? I'm bemoaning my own gear even though its reasonably mid range but bird shots really show up any deficiencies in the glassware. Thanks Just a Canon Rebel with a serviceable but not very crisp 55-250 zoom lens. I'm thinking about buying a nice lens for myself with my holiday bonus. I had a rebel when they first came out. Upgraded a couple of years ago to a 60D but still using the same lenses. Very happy with it. 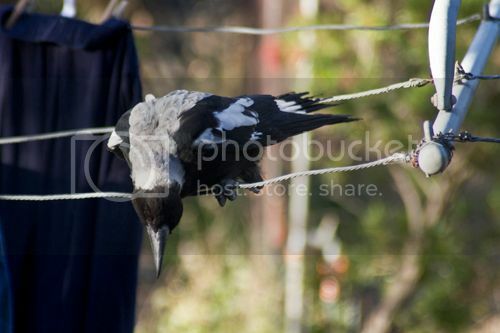 Aussie magpie pic to follow. The thing I like about the Rebel is it's super sturdy. I've done terrible things to mine and it still works fine. What do you think about the 60D? Last edited by Teshi; 13th December 2012 at 06:50 AM. 60D is great because of the flip screen. It means i can really get down low or up high. It also has great video capability. Magpies are the most common visitors to the garden. Family groups abound at this time of year, the juveniles having grey in the white feathers. This year we have been visited by a family with three young. 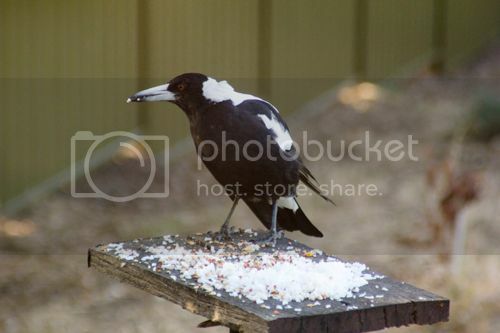 It's funny watching them bouce over the lawn trying to catch bugs.It's apparent from looking in the birdbook that these magpies are from a race known as the white-backed form of the the Australian magpie which predominates in the south and east. The black backed form is the dominant race and inhabits most other areas. Last edited by Magicziggy; 13th December 2012 at 07:13 AM. I spent $100 on a vivitar 2x teleconverter but I really think it was a waste of money. I get the same result by cropping in photoshop. Last edited by Teshi; 13th December 2012 at 07:40 AM. I have a Tamron 70-200 f2.8, which does a great job. One of the reasons I could afford it, is that it is a 'legacy' lens. With a bit of learning, the right camera body (Pentax has their anti-shake in the body), and the right mods (Katzeye focusing screen which was WELL worth the cash) the cost of making delicious photographs comes WAY down. If your body doesn't do anti-shake, you can always use old-school techniques...like paying for a better tripod, shielding yourself from wind etc. I like Pentax because they have been famous for the quality of their prime lenses. I have access to a catalog of lenses forty years deep. Now I wish I lived somewhere that I could find lots of those old ones...Any big-city garage-salers out there willing to keep an eye out for me? This always confuses me. If they are interbreeding to produce viable and fertile offspring, doesn't that mean they are in fact the same species? Are you thinking of ring species like the lesser black-backed/herring gull thing? 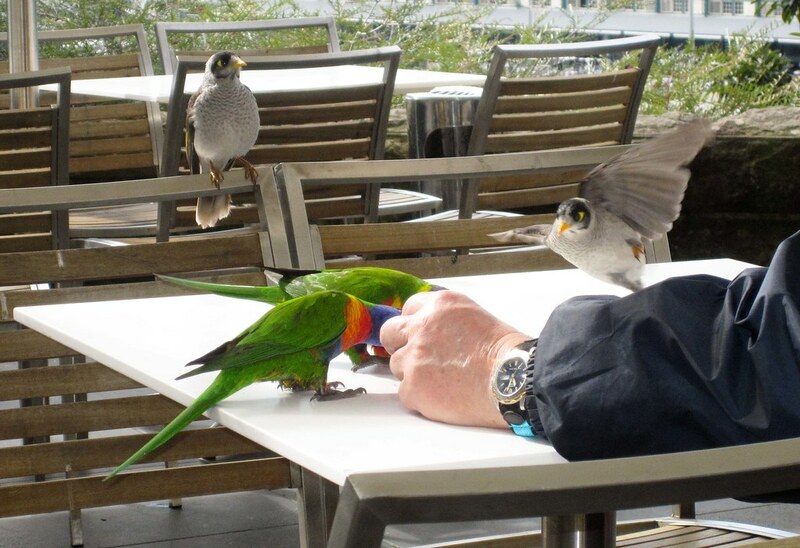 Took these on the cafe patio of The Art Gallery of New South Wales in the Domain in Sydney. 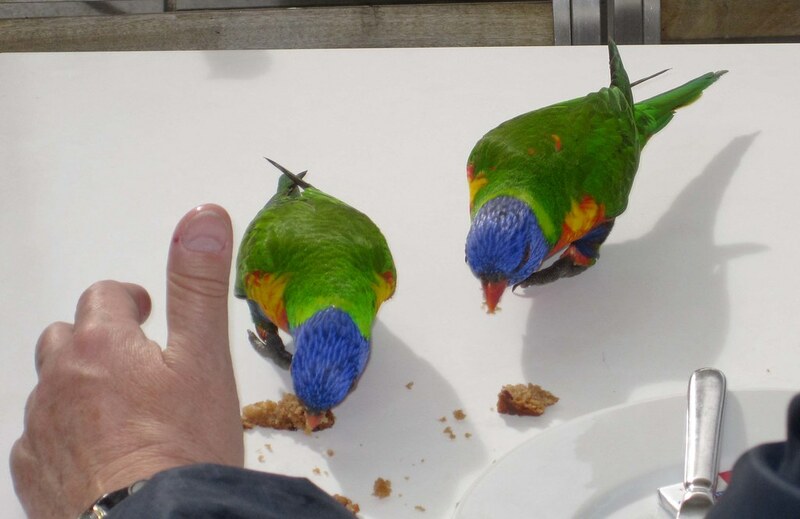 The guy was obviously a regular feeder of this pair of what he told me were Rainbow Lorrikeets and was jealously guarding snack time from the other birds. The other two are hugely common but I don't know what they are - anyone? Are horses and donkeys and zebras the same species? Lions and tigers? Horses and donkeys beget infertile mules don't they? Other equid combos I'm not sure about. Likewise, ligers/tigons or whatever - are they fertile? - answers own question - wiki says no. So I guess your birds are just screwing around too but not producing fertile chicks? In reality, it depends. Some mules/hinnies are fertile. Also birds are not mammals. I'm not a biologist, but it seems bird species that are relatively close to each other often produce fertile offspring. You won't find a crow successfully mating with an owl. A female mule that has estrus cycles and thus, in theory, could carry a fetus, is called a "molly" or "Molly mule," though the term is sometimes used to refer to female mules in general. Pregnancy is rare, but can occasionally occur naturally as well as through embryo transfer. No, I'm no bio either although I do recall both birds and mammals are amniotes so their embryology is presumably somewhat similar. I had thought, from school biology, that the functional definition of extant species is based on them only being able to produce fertile offspring by mating within their own species. If that is the case, then what you say about sometimes fertile mules would seem to place horses and donkeys right on the breaking edge of that definition. however, if two birds can breed successfully at any time, then surely by the functional definition we would have to say they belonged to the same species wouldn't we? Our classification as distinct species based on plumage differences or whatever would then seem to be only a convenient labeling system for ornithologists. I dunno - is there a bio in the house? is satisfying on so many levels. Ravishing!